The Red Room is a 19th Century Swedish state of the nation novel. Put that way it doesn’t sound very enticing, but what’s odd is that it’s also one of the most topical novels I’ve read in a while and it has more to say about 21st Century Britain (and I suspect many other countries) than most contemporary British novels do. In a way that’s a slightly depressing comment on current fiction. Perhaps the real point though is that for all the advances we’ve made in the last 130 years or so, we’re still the same people we ever were. A young man named Arvid Falk quits the civil service to follow his dream of being a poet. He joins up with a group of artists and writers who meet most nights in the Red Room, a private dining area in a cheap café. Arvid dabbles in journalism to pay his way, while his brother Carl Nicolaus Falk grows rich from money-lending and investments. Arvid despairs of the waste and stupidity he encounters in the civil service, but journalism and writing are no better. Publishers expect him to churn out cheap content at minimal rates and minimal research (the Guardian’s Comment is Free anyone?). The politicians he reports on are venal, the businessmen self-serving. To make matters worse, Stockholm is full of young men writing poetry about how unhappy they are. Nobody wants to read any of it. The others in the Red Room include men of talent, but of the two painters in the group the best of them is out of fashion and ignored while the lesser does society portraits for which he’s applauded and well paid. In the main they’re desperately poor, regularly pawning their few possessions so they can afford their next meal. Stockholm is not a place that values its artists, not the ones who produce art for its own sake anyway. Meanwhile, Arvid’s brother is an utterly dislikeable man who lends money to his friends more so he can exert power over them than for the paltry profits it affords him. His pretty young wife does good deeds in the community, but only because its fashionable. He has his company contribute to his wife’s charities, but only so long as everyone knows he’s doing it (and his contributions consist largely of risky stocks which he wants off his own books anyway). Everywhere is cant, pandering and self-interest. Arvid is innocent, but he’s young and it’s noticeable that nobody here with any experience of life shares his early optimism. 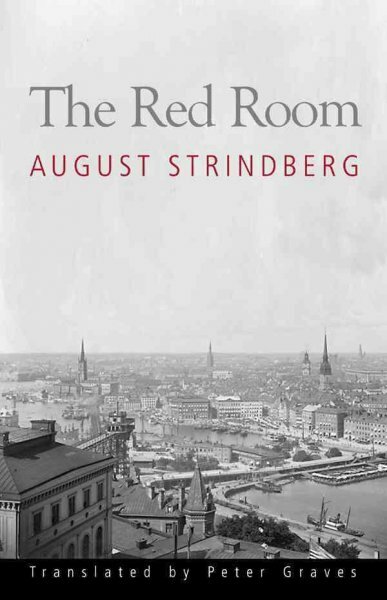 Strindberg writes all this with zest and humour, and I found The Red Room a hugely enjoyable read. Satires aren’t always funny, but this one is and the anger doesn’t overwhelm the comedy. There are a few problems though: the range of targets is so broad that the book becomes a bit patchy in places, characterisation isn’t particularly deep and there’s a slight feeling that the different sections of the book may have been stitched together from different sources (perhaps written at different times) so that stylistically it doesn’t all quite hang together.At 300 pages all in though the weaker sections don’t overstay their welcome and the whole is so good that I could easily forgive the occasional flaws. The art critic was an old academic who had never held a brush but belonged to a brilliant society of artists called Minerva. This gave him the opportunity to describe works of art to the publci before they were even painted, thus saving his readers the trouble of coming to an opinion of their own. He was always kind to those he knew and never forgot any of them when reviewing an exhibition. His long-standing habit of writing nice things about them – how would he dare do otherwise? – and his ability to mention twenty works in half column made his critics think of a game of Happy Families. He carefully refrained from mentioning younger artists, however, and thus the general public, not having heard any new names for a decade, began to despair for the future of art. Replace art with literary fiction in that quote, and you pretty much have the state of broadsheet newspaper literary criticism in the UK today. Governments using public cash to prop up failed private sector investments? Senior executives taking legally questionable risks and then escaping all personal liability? Privatised profits and nationalised losses? Seems pretty current to me. That quote above goes wider than just reviewing. In the US both MSNBC and Fox feed their viewers the news they want to hear, carefully avoiding any serious hint of other viewpoints. Newspaper readers (those who’re left) choose papers that reflect their politics, google sorts us into filter bubbles which on the one hand means search results genuinely are more relevant but on the other means we only see what we already expect to. The technology changes, but the problem Strindberg’s satirising in that quote above hasn’t changed at all. As a rule of thumb books don’t become classics, or get translated, without good reason. A translated classic then tends to be a bit of a sure bet (though not always, some classics have huge academic or historical interest but make for lousy reads). It’s a little like foreign language film (if you’re an English speaker). Nobody goes to the trouble of making subtitles, importing and marketing some domestic turkey. They do it for the good stuff. The Red Room is the good stuff. If you’ve ever had the faintest interest in Swedish literature this is the place to start (and Doctor Glas, which I’m reviewing soon, is the place to go to next). If not, and I didn’t, this is still a rewarding novel with a lot to say about the state we’re in, which sadly is much the same state as we’ve been in since long before my grandparents were born. There’s a free version of The Red Room available on kindle, but I’d recommend buying this Norvik Press edition anyway. The Peter Graves translation is excellent, and well worth spending a little money on. There’s an excellent review of the free translation here at Bookaroundthecorner’s blog. It was Emma from that blog who persuaded me to read it. Thanks Emma.